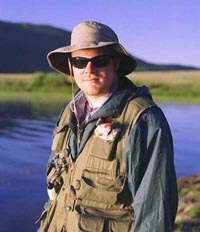 Mike has been fly fishing exclusivly since the summer of 1998. Spending most of his time on local ponds Mike has become very good at catching warmwater fish. Bluegills are often on the end of his line any evening in the summer. His wife Crystal accompanies him on most of his fishing trips and she also is an accomplished fly fisher who has been fly fishing exclusivly since they met in April of 2000.